In ESO, there are many challenges and activities you can experience with your friends or fellow players, but if you prefer to play alone, there’s a ton of amazing solo adventures waiting for you, too. As a solo adventurer in ESO, you can take on exciting and captivating quests throughout the game, and almost every zone in ESO, including the main story from the base game and each Chapter, can be explored alone, giving you the freedom to see and experience Tamriel at your own pace. If you want to challenge yourself, the Maelstrom Arena in Orsinium is the perfect test for the single adventurer, providing nine tricky stages and extremely tough boss fights for you to battle your way through. Don’t worry, the rewards for such a challenge reflect the task, since Maelstrom Weapons are some of the best in the game! Sometimes it pays to go it alone. Since ESO’s launch almost five years ago, the world of Tamriel you know and love has grown massively with a host of new DLC zones and Chapters. In addition to the ESO base game (which has 22 unique zones to explore), the game’s many DLCs have expanded into regions such as the Imperial City in Cyrodiil, the township of Falkreath on Skyrim’s southern border, and even the cities of Anvil and Kvatch on the Gold Coast, just to name a few. 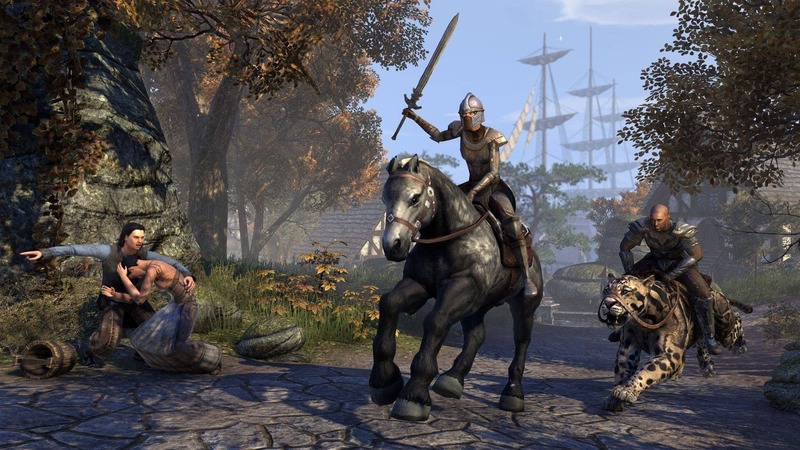 In addition to the DLCs, larger zones and adventures have also been added with Chapters, including Morrowind (allowing you to once again explore the island home of the Dark Elves), Summerset, and Elsweyr coming later this year. Chapters bring massive new areas to explore as well as all-new mechanics and challenges. Of course, you’re not just exploring huge, open worlds, but you can also discover tons of quests, group activities (like Dungeons, Trials, or world events), crafting, trading, and even PvP activities if you’re up for a fight. In Tamriel, a new adventure is always right around the corner. Take note that while the amount of new adventures and stories can seem daunting, you don’t have to complete them in any particular order. Most, if not all, of the zones tell their own unique stand-alone stories. You can view all the different updates, DLCs, and Chapters we’ve released on our website. ESO’s combat system is more action-oriented than traditional MMOs, so if you’re planning to get the better of your foes, prepare yourself for fast-paced and reactive combat. 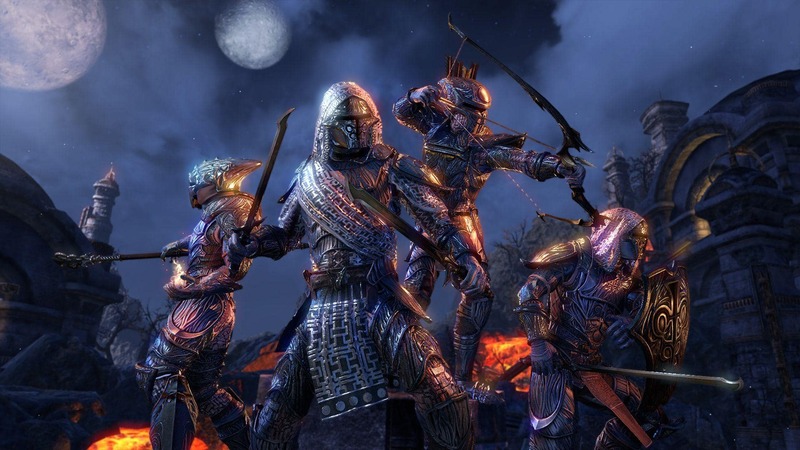 In ESO, every character has the ability to block, dodge, sneak attack, and interrupt their enemies while also making use of light attacks, heavy attacks, and a massive selection of abilities. Additionally, any of ESO’s classes can use every piece of armor and weapon in the game. When facing down Tamriel’s threats, you have to be on the move constantly and keep your head on a swivel. Just like any Elder Scrolls game, you can completely customize how your character plays, and as you quest and explore, you can discover and unlock the abilities for many different Skill Lines. This gives you the opportunity to personalize how you fight and (of course) win. That’s not all, however, since even ESO’s many different abilities are unique in that combat is resource-based instead of cooldown-based. This means that while you can spam the same powerful ability over and over again, you’ll quickly run out of Stamina or Magicka if you do, making ESO’s fights especially strategic when it comes to your attack rotations and resource management. All of this makes ESO’s combat especially exciting and dynamic while also allowing you to fight your way. If you like playing with others, in ESO, you can explore the world of Tamriel your way and are never limited by your character’s level or the level of your friends. When you enter a new area in ESO, the game ensures that everything is scaled properly for that area’s challenges, meaning you can go wherever you like, with whomever you like, whenever you like. Because there’s no real level restrictions in the game, you will never feel like you’re behind or have to catch up when playing with your friends. Gone are the days when you and your comrades had to be the same level to enjoy the same adventures. Now, there’s nothing stopping you from taking on all of Tamriel! 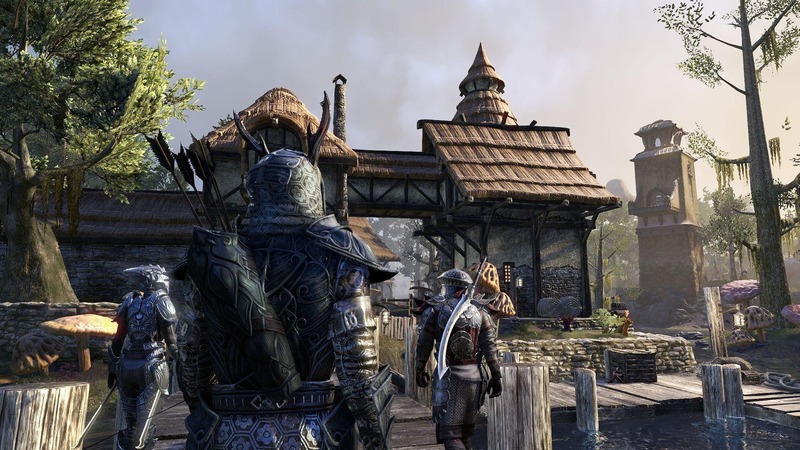 ESO is a big game, and as mentioned above there’s a ton for you to do and see, so it’s easy for new players to become overwhelmed with all the different choices and ways to play. 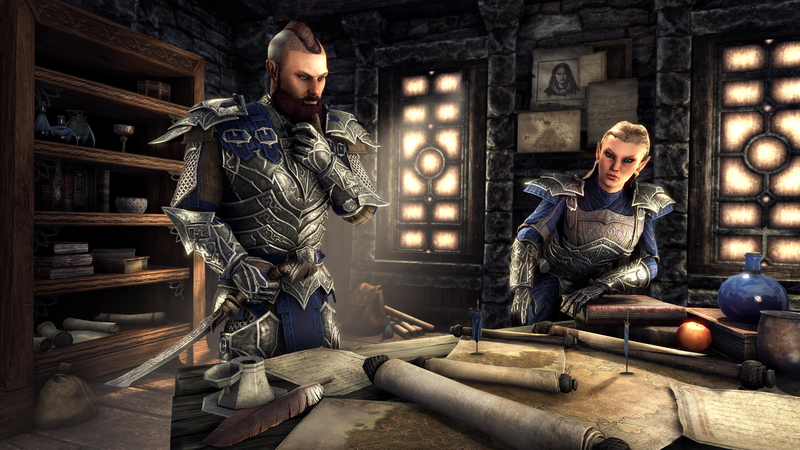 To help new (and sometimes veteran) players make the most of their time in Tamriel, over the last year, we’ve added two important new features: the Level Up Advisor and Zone Guide. The Level Up Advisor helps you determine where to put your Skill Points and how to build your character to match the way you want to play. Once you’re confident and comfortable with carving out your own path, you can simply disable the tool. The Zone Guide, accessed from your map, helps you locate all of a zone’s various features, including quests, Wayshrines, points of interest, and more, giving you a little more direction in your adventures when you need it. Of course, these are just some of the great reasons why now is the perfect time to jump into The Elder Scrolls Online. There’s also massive open-world and small-scale PvP, challenging four-player Dungeons and 12-player Trials, fun in-game events, all manner of customization options with the Outfit System and Housing, and of course, the freedom to build your character and play your way. With the Free Play Event kicking off today (Thursday, March 28) and running through April 3, you can download and play the base game and the Morrowind Chapter completely free, with no strings attached. You can even jump straight to the isle of Vvardenfell and start your adventures there. We’ll see you in Tamriel! Play The Elder Scrolls Online and experience Tamriel like never before during our Free Play Event!